Most people find themselves thinking twice before purchasing a classic white blouse or shirt. The fact is that white clothing just doesn’t seem to last very long. Even if you can manage to avoid the accidental stain, their crisp brightness begins to fade a few washes in. The majority of people tend to rely on bleach to keep their whites crisp and clean. However, this solution is laden with toxic chemicals that can cause skin and respiratory toxicity, especially in children (1). Another common product used to wash whites is detergent that contains optical brighteners. Optical brighteners are chemicals that help enhance the whiteness of your clothes by leaving a residue that changes UV light waves to enhance blue light and minimize yellow light (2). Because these brighteners linger on your clothes, their chemicals stay in constant contact with your skin, where they can cause sensitivities and rashes. Optical brighteners may even be toxic to humans, and may cause developmental and reproductive effects (3). Baking soda is a natural cleaner and deodorizer, making it the perfect way to remove difficult stains and smells. Simply make a paste with baking soda and water and apply to stains as a pre-wash treatment. You can also use it as you would any powdered detergent, especially to wash to wash your whites. Hydrogen Peroxide is an ideal bleach substitute thanks to its strong whitening capabilities. Just add 8 ounces of a 3% solution of hydrogen peroxide to each load of laundry. Like color-safe bleach, hydrogen peroxide is an “oxygen bleach”, meaning that it breaks down to liberate oxygen gas, which then oxidizes or bleaches the stain. In fact, hydrogen peroxide is the key ingredients to powerful chemical cleaning solutions like oxyclean. You can even use it to right stubborn stains on bright-colored clothing (4). It can be frustrating dealing with embarrassing yellow armpit stains you just can’t seem to wash out. Fortunately, distilled white vinegar is an excellent way to fight sweat and oil stains, kill odor-causing bacteria and soften fabrics. 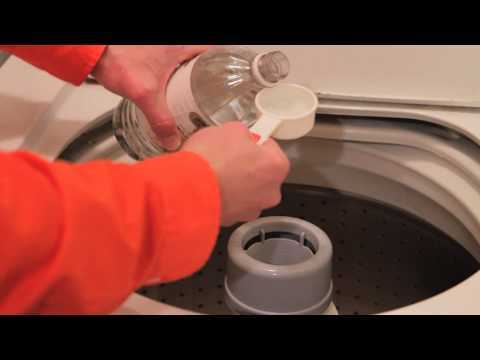 Just add ¼ – ½ cup of distilled white vinegar into your laundry machine’s fabric softener dispenser and use a natural laundry detergent in the detergent dispenser. You can also use it to clean your machine or soap scum and mold. Just add 1 cup of vinegar to an empty machine and select the hot water and full cycle options. All natural, non-toxic dish detergent is also handy when it comes to washing those whites. The same agents that help break apart dirt and oil on your dishes work on your clothing. While you can’t rely solely on dish soap to do you laundry, it’s a great way to boost the cleaning power of your detergent. 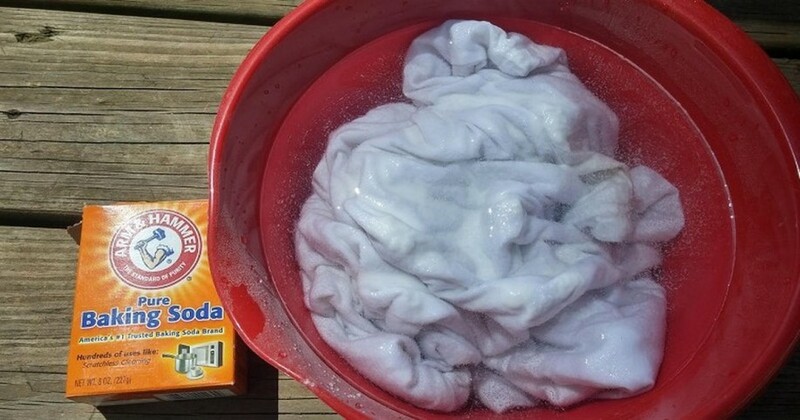 Simply a ¼ cup of dish soap to your laundry detergent to make your clothing bright again. Remember, it’s important to use detergents that are chemical and additive free, to be safe we suggest chlorine-free and phosphate free versions (5). Lemon juice is one of the most versatile household cleaning ingredients. Not only can it disinfect counters and cookware, fight dish grease and clean mirrors, it can also help keep your clothes clean. Simply add a cup of fresh, strained lemon juice to the rinse cycle while washing your whites or pre-soak your whites in hot water with lemon few hours and wash as usual. It’s important to let your clothes dry out in the sun after either treatment to keep your whites bright (6). 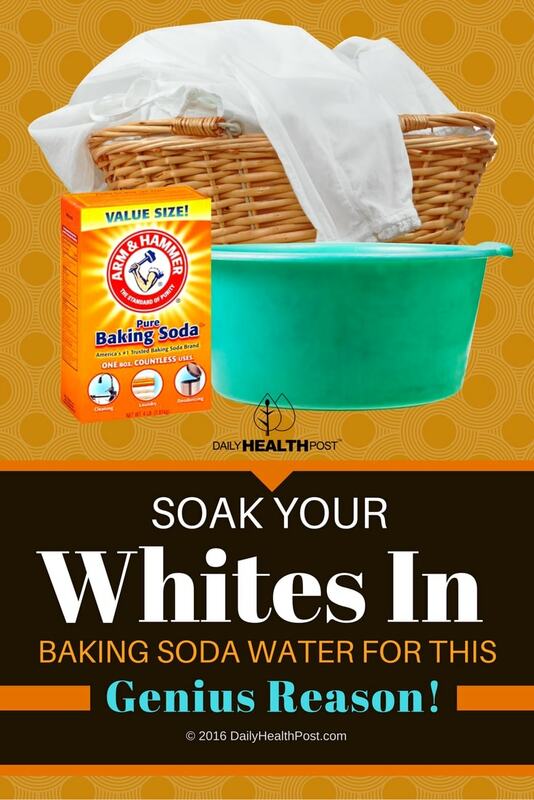 Latest Headlines » Wellness » Soak Your Whites In Baking Soda Water For THIS Genius Reason!